American Cherry dowels are commonly used in fine furniture and cabinetry making as well as moldings and millwork. 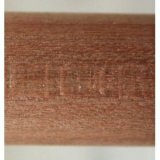 Our cherry dowel rods are a medium density hardwood with a fine uniform straight grain texture which is easy to machine, nails and glues well and when stained produces a smooth finish. Cherry Dowel Rods, 36" Lengths. Click "More Info | Order" for pricing discounts and to place your order.